So crude oil continues to weaken even further and with news of Iran’s oil production will now enter the world market its moving even lower. Dropping on trading today below $28 a barrel. So whilst Palm Production is starting to slip mainly caused by ‘El Nino’ prices are falling as demand for edible oils weakens because of the crude oil price. Coconut oil prices are rising slightly as lower crops impacts prices but weaken edible oils in general is keeping prices from running away. Coconut oil does not share the same bio-fuel demand so its not as susceptible to weak crude as Palm Oil is. Low nuts supply is slowly forcing up prices. Desiccated prices are slowly climbing as well. There have been rumors swirling round of a number of containers of desiccated contaminated with Salmonella in Germany which is driving some buyers to the safety of Philippine material. SO whilst prices from Indonesia are rising Philippine prices are rising faster. Only Sri Lanka price is dipping as very low freight rates and weak Middle East demand push there prices lower. The market is overall firmer than it was last week. Philippines – Prices are definitely showing signs of firming up here. Many factories are are abstaining from offers. All factories are completely sold out for Jan deliveries and many are fully committed for Feb as well. In all likelihood should an order be placed today in the Philippines, if one is lucky a delivery would be made in Feb, but more than likely deliveries will either be 2nd half feb or roll over into March. Supplies are without doubt a problem with mills struggling to secure raw nuts for production of DC, Coconut oil and other coconut related products. Indonesia – the supply situation in Indonesia is even worse than that of the Philippines and all mills continue to struggle to secure adequate supplies of raw materials to run their factories. Many are producing intermittently based on arrival of raw nuts. Delays in shipments are being experienced and is to be expected further as we get on in the month. Like the Philippines, many factories are reluctant to quote but for those who are quoting, we are seeing a price escalation week on week of between USD100/mt to USD200/mt depending on the mill. Vietnam – supplies are low and they are dealing with huge demand coming from their behemoth of a neighbor China for the upcoming Chinese New Year festivities. Factories are having their limited available capacities taken up by Chinese demand which is usually a border based trade. Sri Lanka – prices here have shown some signs of ease. This however is not something to be surprised with because Sri Lankan pricing prior to the holidays were at record highs ie much higher than any other origin, and all that is happening now is that prices are rationalizing to more realistic market levels. The oil market remains firm, particularly that of Coconut oil which is outperforming even Palm Oil. One has to consider that in a period of relatively low demand which is typical at the beginning of a year, prices are still firming. What will happen when demand begins in earnest? All signs and signals still point to market prices moving northwards as we get on in the 1st quarter and we would think that if one has a requirement it is better to buy now than wait in anticipation of the market going down because on the face of it, this does not seem likely in any origin. Looking at the nut and dried fruit markets over the last couple of years, many could be described as volatile, erratic or unstable. Almond prices continue to rise, driven by lack of rain in the main producer California. Hazelnut prices have fallen sharply, after rising to an all-time high in May. Turkish sultana prices are significantly higher this year due to a damaging spring frost. While dried apricot prices have been falling from last year’s peak. Desiccated coconut is no exception, with a largely unpredictable trend over the past couple of years. The Philippines is the main global exporter of desiccated coconut, accounting for more than a third of exports. Early in 2014, Philippine desiccated coconut prices rose sharply in response to the destruction left by Typhoon Haiyan. The typhoon caused catastrophic damage to agriculture and infrastructure in the Philippines and resulted in a large number of fatalities. This year, prices have fallen to pre-Haiyan levels, plummeting 45% since the beginning of the year. To understand why the prices have fallen, we need to consider several factors. The price of desiccated coconut closely follows the price of coconut oil. 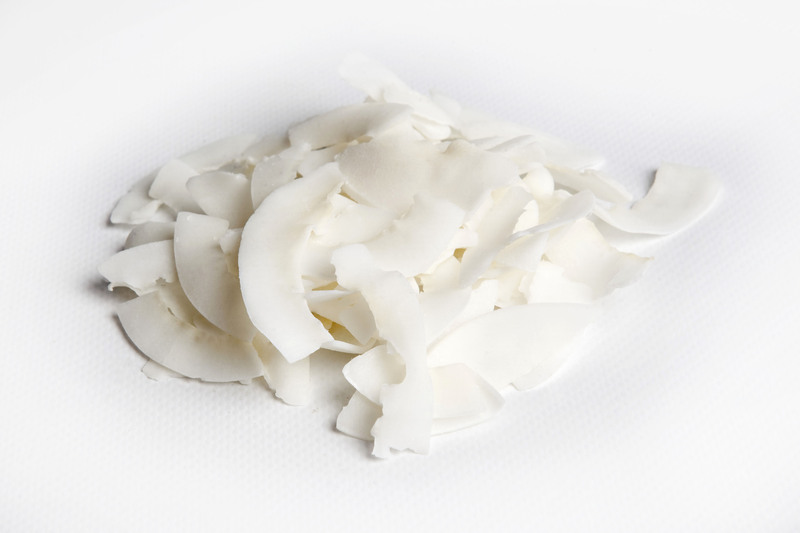 When the price of coconut oil rises, desiccated coconut prices will soon follow and vice versa, as they compete for the same raw material — raw coconut. The price of coconut oil is largely driven by price trends in other vegetable oil markets, in particular palm oil, due to the oil’s interchangeability. In addition, the price of crude oil can be a factor as vegetable oils are also used in renewable fuels. With crude oil prices falling dramatically over the past eighteen months, the demand for vegetable oils as a source of biofuel has fallen. There has been a pressure from palm oil and palm kernel oil markets due to ample supplies, with prices of both oils falling by 55% and 50% between March 2014 and September 2015. The combination of these factors has contributed to lower coconut oil prices and consequently led to lower desiccated coconut prices. There have also been some aggressive selling strategies from smaller producers in Indonesia, Sri Lanka or Vietnam, which have further supported the downward trend in the desiccated coconut markets. In the past few weeks, however, the price fall has slowed, with El Niño cited as the main reason. Dry weather in parts of Southeast Asia has driven palm oil prices upwards and, with coconut trees believed to be affected by the lack of rain, the price of desiccated coconut seems to have plateaued for the time being. At the moment crude oil seems to be driving the direction of the market. Crude oil rallied slightly last week but again issues with China are weighing heavily pushing prices down, In fact some analysts are now even talking about $20 a barrel being possible. So whilst Palm Oil crops are reducing so is the demand for Palm as a Bio Fuel. Some believe that this will only lead to a bigger jump in Palm oil prices later in the year. Coconut oil prices have been rising even with low Palm Oil prices as lower crops have been constricting supply. Desiccated prices have been rising since the start of the year. Low supply of nuts has been pushing up prices since the end of last year and is continuing now. Today tales of price increases in Indonesia of $100-200 per mt. Only Sri Lanka has reported prices falling but prices there were much higher then other origins anyway.